A GPS unit is a handheld device about the size of a cell phone that determines your location on the planet by longitude and latitude coordinates. Although it can indicate the direction in which you are going, a GPS is more than just a fancy compass. Depending on their complexity, units also provide screen views that include a menu list, a "waypoint" list of predetermined locations, various route descriptions, your present track, and several navigational screens showing combinations of present latitude, longitude, direction, speed, time, ETA, max speed, elapsed time, and more. To begin your adventure you enter a waypoint where the geocache is hidden and make tracks! Just about anyone can put together a geocache, find a good hiding place, and then post the directions on an internet geocaching website. Some thought needs to be put into a safe, accessible location, preferably with some intriguing characteristics. Also, it should be obvious that any geocache site should be public accessible and not on private restricted land. The person who first places the cache, known as the "founder", uses the internet to post information describing how the cache site can be found. This information includes the GPS readings of the cache's latitude and longitude, and clues that help determine how to get to the site. The GPS readings will be accurate enough to describe the cache's location within a few feet and are frequently given to the parking area from which you will start. Some descriptions also incorporate GPS waypoints, also given as latitude and longitude values, to guide you along the way to the cache. Above: The cache partially hidden in the woods. four bits and, of course, a church key. 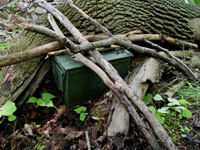 A geocache is usually a waterproof container, like a metal box or even Tupperware. The size and contents of the geocache vary greatly from site to site but almost always include a logbook and writing implements. Many times the site's founder will write comments in the logbook, describing interesting features of the site such as historical or geological data, possibly even pointing the way to other geocache sites, some of which are not yet known even in the wide world of the web. The logbook and its comments are usually not the only things that will be found in a geocache. Most containers hold all kinds of trinkets and welcoming gifts like photos, maps, candy or trail snacks (eat them at your own risk! ), band-aids, buttons & bumper stickers, novelty erasers, small notepads, toy compasses, and a wide variety of other imaginative novelties. Some surprised cache finders have opened containers to find real treasure: jewelry, small cameras, CDs, even money! When you find a cache, make sure you read the logbook. You'll be amused by some of the comments and poetry you may find there. Geocache etiquette requires that successful finders at least enter their name in the logbook and the date and time of their discovery. Regardless of what you find in a cache, there is one simple rule that must be followed: "Take an item, leave an item". It does not have to be fancy or valuable, just something appropriate... time for you to be clever! Remember to tightly close the cache again, sealing out moisture and nosey creatures, and put it back where you found it. Some geocaches contain an interesting variation to the item rule. An item may be designated as a "hitchhiker" or "traveler" containing a small note instructing the finder to take the item but to make sure they leave it at the next geocache site they locate, along with a small annotation telling where and when it was found. Some traveling items request that each person who finds it send an email to a given address informing the original owner of where the item was found. To hunt geocaches, you'll need to refer to a geocaching website. The GPS unit will be used to guide you along the way following the directions as given on the website. The posted clues and directions generally contain GPS readings of latitude and longitude and descriptive directions which vary greatly from site to site, depending on who wrote them. Directions might be very bland and direct while others may be poetic or written as puzzles that you need to solve from point to point along the way in order to find the cache site. Since a GPS unit is capable of precisely determining a location with an error of less than 50 feet, it might seem like there's not much sport in geocaching. But knowing where a location is on a map is not the same as knowing where it is on the ground. And then there is the issue of getting to the site. Streams, cliffs, swamps, fences, etc, will obliterate your preconceived route to the cache. Even after you get to the spot indicated by the GPS, finding the cache remains a challenge. Remember, it will probably be at least partially hidden to help conceal it from someone who may find it by accident and remove it, not understanding what it is. You may be surprised at how many geocache sites exist; and in so many places! Geocache sites are everywhere, existing in well over a hundred countries worldwide. It's hard to decide which geocache to look for first. There are dozens in Northwest New Jersey. In my "home turf", Warren County, geocache sites exist at Foul Rift, Manunka Chunk Tunnels, Roaring Rock Park, Merrill Creek Reservoir, Mt. Tammany, Jenny Jump State Park, near Lake Susquehanna, Walters Park in Phillipsburg, Sunfish Pond, and others. Access to some geocache sites is fairly easy...you just need to find them. For instance, at Merrill Creek Reservoir you need only to walk the right combination of trails, locate certain annotated features along the way until you get to the cache site. The walk is flat and easy. Other sites are located at places to which access is much less direct. In the Delaware Water Gap, before finding some hidden caches, you must get to the top of Mt. Tammany which is a strenuous hike, more like a climb at some places. Seasonal conditions come into play. At first, summer weather may seem more conducive to this sport but the thick undergrowth in many areas may limit your ability to see a cache. Late fall and early spring are perfect. Snow and ice present obvious problems, but geocaching can very nearly be a year-round sport. Various geocaching websites will help you get started in this sport. If you already do geocaching, the websites are frequently updated with new caches, and you'll find additional cache sites not previously recorded. One of the most descriptive geocache sites is www.geocaching.com. Make sure to visit this well-designed, informative website. Read the material that it presents, pick a site or two, and the hunt is on! A standard GPS is a receiver, and only a receiver. It receives satellite signals but does not transmit signals out. It can indicate exactly where you are on the Earth but it does not transmit your position to anyone else. Some GPS units incorporate a positional transmitter, but a standard GPS does not have that feature. To make the system function, at least 24 satellites are positioned around the earth, circling in stationary orbit. This means they are orbiting at the exact speed and track needed to keep them positioned over their respective assigned spots below them. The satellites are spread out above the earth so that at least five of them are "visible" from any location. The signals that a GPS receives from these satellites, allows it to exactly calculate its position, including elevation above sea level. Its position is given as latitude and longitude. A GPS unit contains memory, much like a computer's memory, allowing it to store predetermined waypoints and your track. They may be used to show where you wish to go or to record spots where you've been that may be recalled later by the unit. Waypoints are also used to define a route to follow. Your track is a point-by-point history of your movement. By using these two features, a GPS can guide you on a predetermined route stored in its memory while it is recording a history of your movement, which you can view at any time on its LCD screen. Using mapping software at home, you can predetermine a route you would like to follow on a hike or drive and then download it to your GPS, making it possible for the unit to guide the way. Or, if you'd like to see where you've been on a hike or drive, you can connect the GPS to your computer and upload your track into mapping software, which will show you where you walked or drove and show any waypoints you entered into the computer along the way. If you have questions or comments about these and other outdoor destinations in Warren County, please e-mail Bob.